Visitors can enjoy a one-of-a-kind shopping experience with economical prices, Sundays from April 8 through December 23, 2018. 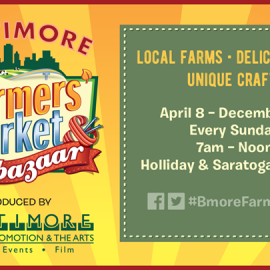 While strolling through Maryland's largest producers-only market, shoppers can revel at the sight of a vast quantity of foods, including crisp fruits and vegetables, poultry, seafood, beef, pork, lamb, bison, goat, rabbit, fresh baked goods, flavorful herbs and organically raised and produced milk, yogurt, butter, eggs and cheese products. Additionally, dozens of food vendors add spice to the market with multicultural cuisine such as popular pit beef sandwiches, omelets and breakfast burritos, crepes, wood fired pizzas, pies and quiches, soups, noodles and dumplings. Vegan items are sold as well.